Karst is widespread worldwide and the lives of millions of people are closely related to it. But in the 21st century, for most of them, even for those living in karst regions, it is "terra incognita" - "thanks" to the education systems. It is therefore paradoxical that the theme "karst" continues to be overlooked and underestimated in the curriculum, both in schools and Universities. This is very true for Bulgaria, where ¼ of the territory is karst. In Bulgaria studies of karst and caves have been held since the late 19th century. Bulgarian Geographers have made a significant contribution. Karstology is a traditional field of study at the Geographical Institute of BAS (present Department of Geography at NIGGG-BAS) and it continues to be actively developed by the Experimental Laboratory of Karstology. Its team performs interdisciplinary research and integrated monitoring in one of the most representative karst regions in this country. An important achievement of the Laboratory is the application of the geosystem approach to karst research. There is no doubt that good knowledge of karst and especially of its specificity is a global problem. It predetermines karst education as one of the main priorities of the Experimental Laboratory of Karstology. Since 2010 the Laboratory has been developing a specialized educational strategy "ProKarSTerra-Edu", in international cooperation. It is based on the integration between the research concept of karst geosystems and the concept of “Lifelong Learning”. A favorable basis for the implementation of the strategy is the widespread distribution of highly diverse karst in Bulgaria with protected karst territories and a scientific network of model karst geosystems suitable for educational activities. The main objective of the ProKARSTerra-Edu strategy is through innovative educational forms to provide the minimum of knowledge, skills and competencies about karst and to create the necessary conditions for the training of key karst specialists. The main priority of this strategy is the achievement of optimal land use in the karst territories of Bulgaria. The methodological platform of the ProKARSTerra-Edu strategy is the original ProKARSTerra paradigm. By integrating the concepts of Karst Geosystems and Lifelong Learning, it combines three important components, namely scientific, research, management and educational ones. This allowed and prompted the use of ProKARSTerra in a much broader sense and it became a trademark of the Experimental Laboratory of Karstology. 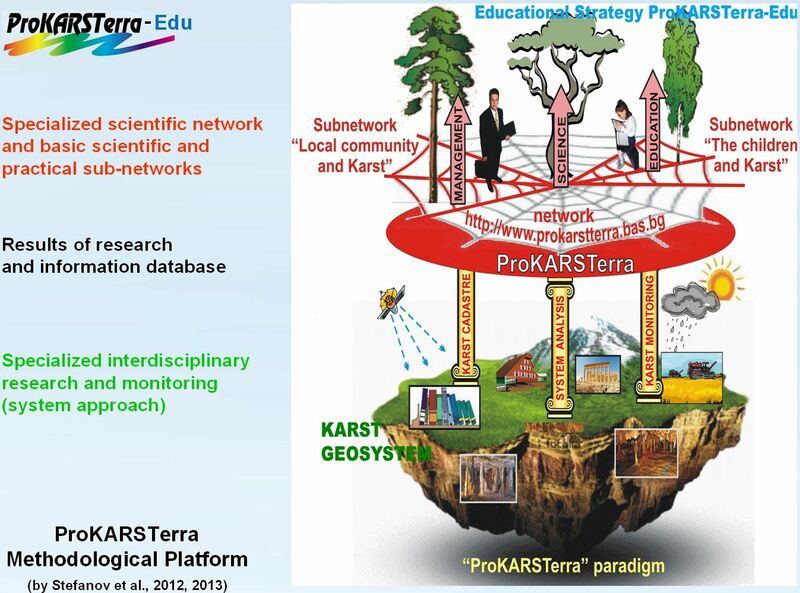 Theoretical-Methodological Platform of the educational strategy "ProKARSTerra-Edu"
In the educational strategy of ProKARSTerra-Edu the main focus is on field training in the actual conditions of model karst territories using research methods. The exceptional combination of morphogenetic karst types makes Bulgaria a unique natural laboratory for studying this natural phenomenon. Moreover, the millennial active presence of humans has left deep traces on karst. Karst, and especially its underground "study rooms" (caves), are very attractive to young people and offer opportunities for teaching out of the classroom, in the real conditions of karst territories and for applying research methods and experiments, incl. using specialized equipment. The specific environment and learning methods generate positive emotions that stimulate creativity and lasting interest in karst. Regardless of the relatively limited time for the competition, terrain training is very effective because it forms synthesized knowledge acquired intensively in the natural environment under the guidance of highly qualified specialists. But in addition to education about karst, terrain training in a karst environment implies another, especially up-to-date education through karst. Due to the specifics of karst and its pronounced interdisciplinary nature, students involved in field education understand the connections between what they learn in the different school subjects and try to implement this knowledge in a real natural environment. In turn, teachers in different subjects and with different professional specializations have the opportunity to discuss and test different variants of interdisciplinary links - one of the most important contemporary educational issues. In the development of the ProKARSTerra-Edu educational strategy, different forms of field training have been experimented with participants from different age, educational, professional and national groups. Experience has proven that the Traveling School of karst is most interesting and effective. The experience gathered in working with pupils during the 2 Traveling karst schools held in Bulgaria is also applicable to the field work of the current competition. In addition to formal education, the opportunities of non-formal education about karst should be actively used, to fill in the gaps in the population knowledge about karst (Lifelong Learning). Stefanov P., Stefanova D., Mikhova D., Štefka L. 2013: “proKARSTerra–Edu” – a karst-educational project. 16th International Congress of Speleology, July 21-28, 2013, Brno, Czech Republic – Proceedings, Vol. 1., Praha, p?. 307-311. Stefanov P., Stefanova D., Mikhova D. 2013: International competition “Karst under protection – Gift for the generations”as a part of the educational strategy “proKARSTerra-edu”. IGU Kyoto Regional Conference, August 4-9. 2013. Stefanov, P., D. Stefanova. 2017: A Traveling School of Karst "- a new form of Lifelong learning. - 5th International Scientific Conference "Geographic Sciences and Education" (4-5.11.2016, Shumen) - Collection of reports, Univ. ed. "Ep. K. Preslavski ", Shumen, pp. 380-389.